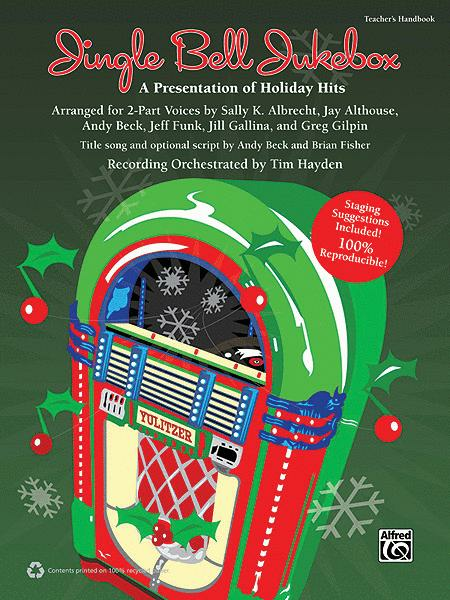 A Presentation of Holiday Hits Arranged for 2-Part Voices (Teacher's Handbook). Composed by Sally K. Albrecht, Jay Althouse, Andy Beck, Jeff Funk, Jill Gallina, Greg Gilpin, with an optional script by Andy Beck, and Brian Fisher. Arranged by Sally K. Albrecht, Jay Althouse, Andy Beck, Jeff Funk, Jill Gallina, Greg Gilpin, with an optional script by Andy Beck, Brian Fisher, and orchestrated by Tim Hayden. This edition: Teacher's Handbook (100% Reproducible). Classroom/Pre-School; Musicals; Musicals and Programs; Reproducible. Children; Christmas; Novelty; Secular; Winter. Book. 80 pages. Alfred Music #00-34711. Published by Alfred Music (AP.34711). ISBN 0739069470. English. Orchestrated by Tim Hayden. Wanna get in the Christmas spirit? Do what all the kids do: sing and dance with the holiday hits featured on our fabulous Jingle Bell Jukebox! Perform these kickin' 2-part arrangements of popular seasonal tunes individually, as a concert set, or as a simply staged 35-minute musical (using the optional soda-shop-setting script). Contains nine reproducible songs with complete choreography! This book is recommended for grades three through eight. Products available: Teacher's Handbook (includes Reproducibles), Enhanced CD (Accompaniment/Performance tracks plus reproducible PDF files of Student Pages & Cover Art), or price-saving Book & CD Kit. Titles: Jingle Bell Jukebox * Frosty Hand Jive * It's the Most Wonderful Time of the Year * Jingle Bells Rock! * Let It Snow! Let It Snow! Let It Snow! * You're a Mean One, Mr. Grinch * Sleigh Ride * Santa's On His Way Medley * Comin' Up Christmas Time.